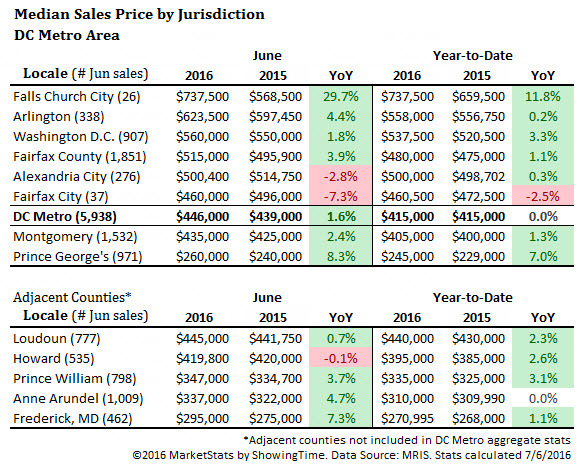 June 2016’s median sales price of $446,000 established a new high for the D.C. Metro area. Prices were up 1.6% ($7,000) compared to last year and up 3.7% ($16,000) compared to last month. Sales volume across the DC Metro area was more than $3.2 billion, up 7.9% from last June and up 14.1% from last month. June closed sales of 5,938 were up 5.1% compared to last year and were at the highest monthly level since June 2006. This is the 19th consecutive month of Y-o-Y increases in closed sales. New contracts increased by 3.9% to 5,979, a new June record. New listings of 7,502 were up 3.3% year-over-year and up 0.9% compared to last month. Active inventories of 11,301 were down 8.4% from last year but up 2.1% from last month. This is the second consecutive month of declines in year-over-year inventory levels. The average percent of original list price received at sale in June was 98.1%, up from last year’s 98.0% but down from last month’s 98.3%. The median days-on-market for June 2016 was 14 days, down one day from last year and up one day from last month. Falls Church City remains the most expensive location in the region with a June median sales price of $737,500, (up 29.7% from last year, which was the highest percentage increase in the region). 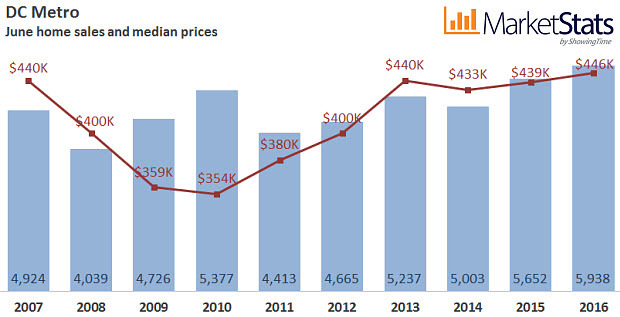 Fairfax City saw the largest percentage decline in median sales price of 7.3% to $460,000. June’s regional overall median sales price rose to $446,000, a 1.6% increase over last year’s $439,000. This month, single-family detached prices saw an increase, rising 0.9% to $555,000, while townhome prices were flat at $415,000 and condos declined 2.7% to $304,000. Prices are 3.3% and 9.0% above the 5-year and 10-year averages of $431,600 and $409,099, respectively. For the first half of the year, Y-o-Y median sales prices remain the same as last year at $415,000. The June overall regional price of $446,000 is 26% above the June 2010 low of $354,000 and 1.4% above the prior high of $440,000 seen in June 2013. There were 5,979 new pending sales at the end of June 2016, up 3.9% compared to last year and down 6.4% from last month. New pending contracts have increased year-over-year for 20 consecutive months (with the exception of the weather-related dip in January 2016). All property types saw increases compared to last year, with condos up 5.5% to 1,550, single-family detached up 3.6% to 2,892 and townhomes up 2.7% to 1,535. Pending contracts were above both the 5-year average of 5,482 and the 10-year average of 4,891. June 2016’s new pending sales number was the highest June level in a decade and was 61.7% above the June 2010 low of 3,697. 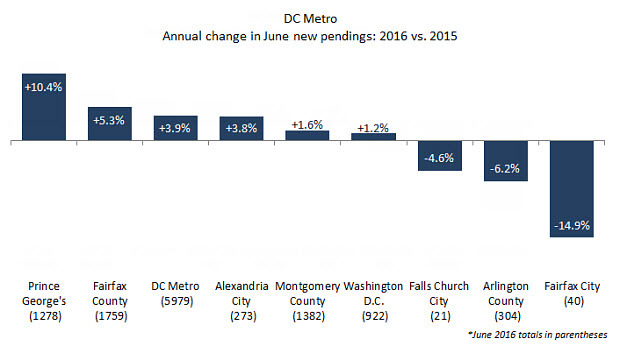 For the entire metro, new pending contracts for January-June are up 5.3% to 33,678. There were 7,502 new listings in June, a 3.3% increase compared to last year and a 0.9% increase compared to last month. New listings for condos increased 5.0% to 1,907, townhomes are up 4.0% to 1,846 and single-family detached increased 2.2% to 3,746. New listings were above the 5-year average of 6,670 and the 10-year average of 6,830. The June new listings are 34.3% above the 10-year low of 5,588 seen in June 2012 and 16.0% below the June 2007 high of 8,934. 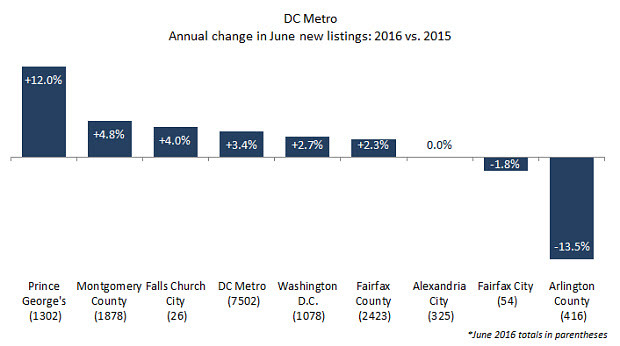 Across the DC Metro area, total new listings for January-June are up 2.2% to 41,488 compared to 2015. Active inventories decreased to 11,301 at the end of June, down 8.4% from last year’s 12,341, the second consecutive month of declining inventory levels compared to last year. All property types show a decrease in inventory levels over last year, with single-family detached inventories down 10.6% to 6,205, condo inventories down 5.6% to 2,979 and townhomes down 5.3% to 2,106. Inventories are 5.9% above the 5-year average of 10,673, but are 25.9% below the 10-year average of 15,258. End of June inventories exceed the June 2013 low of 8,281 by 36.5%, but are down 55.9% from the peak of 25,618 seen in June 2008. Only Washington D.C. saw an increase in inventories (+3.7%). All other areas were down. The regional average sales price to original listing price ratio (SP to OLP ratio) for June was 98.1%, up just slightly from last year’s 98.0% but down from last month’s 98.3%. Over the last decade, the region’s June average sales price to original listing price ratio ranged from a low of 92.9% in 2009 to a high of 99.1% in 2013. On average, homes in Washington D.C. sold at 99.1% of their original listing price in June, the highest in the region, and down slightly from the 99.6% seen last year. The largest gap between original listing price and sales price was in Montgomery County, where the average ratio was 97.4%, down slightly from the 97.5% seen last year. For the January-June year-to-date, the SP to OLP ratio for the entire metro region is 97.6%, up from last year’s comparable 97.5%. The median days-on-market in June was 14 days, down one day from last year, but up one day from last month. Condos had the highest median DOM of 18, while single-family detached had a median DOM of 15 and townhomes had a median DOM of 11. DOM are at the 5-year average of 14 days and well below the 10-year average of 24 days. The lowest June DOM recorded in the past decade was 9 days in 2013; the highest was 47 days in 2008. The highest median DOM is in Prince George’s County, where it is 18 days (the same as last year). The lowest median DOM is in Falls Church City, where it is 7 days (down from 8 days last year). Source: The analysis of the Washington, D.C. Metro Area housing market has been prepared by Elliot Eisenberg, Ph.D. of MarketStats by ShowingTime) and is based on June 2016 MRIS housing data.